I was born in Firenze and I lived my childhood in a medieval village called Castelfranco di Sopra. I have lived in Tuscany all my life, and it has become part of my soul. It’s a place I love and respect, and it never ceases to take my breath away. Although I attended art school in Florence, since my early 20s I have worked for a number of well-known travel agencies and tour operators. While working there, I had the opportunity to plan and lead many tours for English, American and Australian visitors. 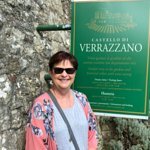 I love leading tour groups and find great pleasure in introducing visitors to the hidden gems of a land that is so rich in history, culture, traditions, food, wine and the warm hospitality of the authentic Tuscan people. During my time working as a tour operator, I frequently observed the great enthusiasm visitors exhibited when they were provided with an opportunity to discover places off the beaten track that other tourists are completely unaware of. This gave me the idea of developing more customized and personal tours that offer a privileged few the chance to see the real Tuscany that is known only to the locals. Now, together with my wife, Laura, I provide you with a memorable experience that showcases the very best of what Tuscany has to offer in a relaxed, informal and fun way. Through limiting each tour group to a maximum of eight people, we ensure that we offer personalized tours through which we give every member of the group the undivided attention they deserve. Join us on a journey of discovery where you’ll become part of an authentic Tuscan family and explore one of the most wonderful places on earth from an insider’s perspective. I was part of a group of 6 women from Texas and 1 Aussie. Tuscany Untouched Tours were our hosts and guides for our 8 day trip. Owner, Matteo Piccardi, was exceptional! His knowledge and expertise of the area were invaluable to understanding the culture of the region. If you want to experience Tuscany without the crowds and congestion, this is the tour for you. We visited many vineyards, most with tastings and lunch, and shipped home many bottles of wine to enjoy with family and friends. Matteo took us to Monasteries, churches, medieval towns and even hosted a steak dinner at his home with his beautiful wife, Laura. Lorenzo, an intern guide, brought his guitar and we sang many American and Italian songs after dinner with Matteo's lovely grandmother. I cannot recommend Matteo, and Tuscany Untouched Tours, highly enough! (by the way, Matteo has a great sense of humor as well!) Manzo, Manzo no Pollo!